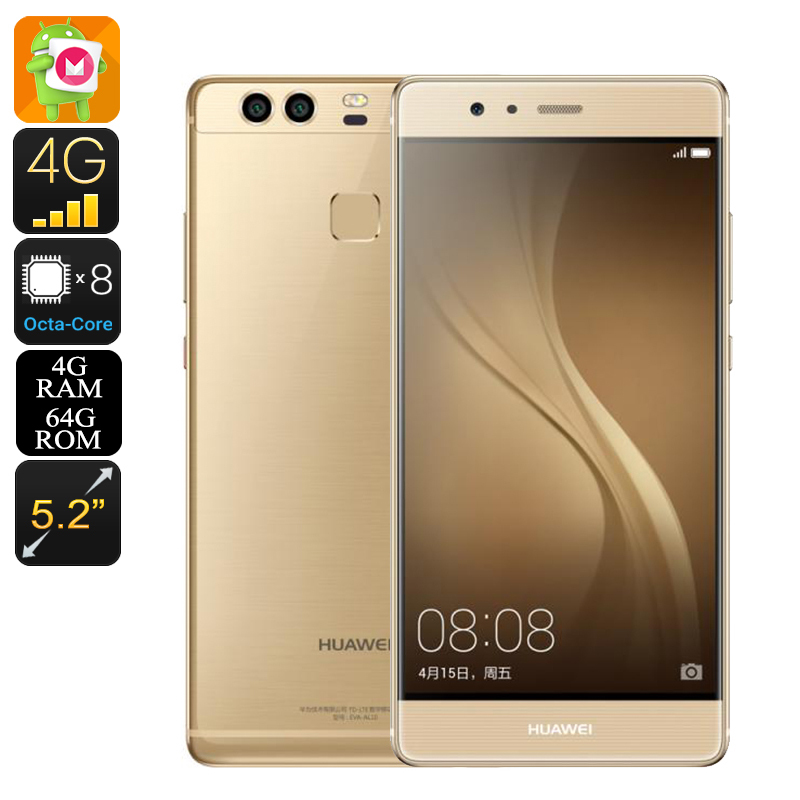 Successfully Added Huawei P9 Smartphone - Android 6.0, Octa-Core CPU, 4GB RAM, 5.2 Inch IPS Display, Dual-Band Wi-Fi, 4G, 12MP Camera (Gold) to your Shopping Cart. The Huawei P9 is an incredibly thin and stylish Chinese smartphone that packs the latest specs the mobile industry has to offer. Running on an Android 6.0 Operating System, this truly incredible Android phone comes along with all the trusted and latest features Android users are familiar with. Along with its stunning 5.2-Inch FHD display, the Huawei P9 portraits vivid colors and high detail, allowing you to enjoy all your favorite media, games, and mobile applications in mesmerizing detail. Featuring the latest IPS technology its display provides you with an ultra-wide viewing angle and a stunning 16m colors, truly taking your mobile entertainment experience to the next level. Gorilla Glass protects this beautiful smartphone from damaging, ensuring that no scratches and drops will stand in your way. Weighing just 144 grams and measuring only 7mm in thickness, this sleek Android phone is an absolute beauty that is sure to impress friends and family at any occasion. Despite its ultra-slim design, the Huawei P9 comes packed with some extremely powerful hardware. Featuring an Octa-Core CPU that has been clocked at 2.4GHz, this Chinese smartphone is capable of handling the latest applications and most demanding games without dropping a frame. Supporting a stunning 4GB of RAM, it deals with the most demanding of multi-tasking sessions as if it’s nothing. Switch in-between your favorite apps, browse the web, and watch FHD movies – no matter what you throw at it, there is nothing that will slow this Android phone down. Enhancing your user experience even further, the Huawei P9 packs a Mali-T880 MP4 graphic’s unit that brings along absolutely breathtaking visuals. With 64GB of internal memory and the added option to insert 128GB of external storage, this phone will offer plenty of space for you to store all your files and media alike. What sets this Android phone truly apart from its competition is the phone’s dual-lens 12MP rear camera that allows you to snap absolutely stunning images. Two lenses allow you to snap professional-grade pictures even in low light conditions. By supporting a wide range of photography modes and optimization features, this camera is fit for any type of photography. Whether you’re out in the city with your friends and enjoy a simple night out, or are enjoying your upcoming holiday and want to capture absolutely stunning scenery – with the Huawei P9 in your pocket you can be assured that you’ll always be able to capture the moment, allowing you to recall all those special memories once back home. Supporting Dual-Band Wi-Fi and 4G connectivity, this Chinese smartphone allows you to enjoy the fastest data speeds out there. Whether you’re at home or on the move, with the Huawei P9 you’ll always be able to browse the web in lightning speeds and stay connected to friends and family back home. Packing a 3000mAh battery, this 5-Inch smartphone provides you with countless hours of continuous usage time, enough to get through multiple mobile intensive days without needing to worry about battery life. With its absolutely amazing specs, the Huawei P9 is a smartphone that is guaranteed to meet the wishes of the most demanding and critical smartphone users out there. The Huawei P9 comes with a 12 months warranty, brought to you by the leader in electronic devices as well as wholesale electronic gadgets..
Arabic: - 5 بوصة الروبوت الهاتف - Chinese Simplified: - 5 英寸的 Android 手机 - Czech: - 5 palců Android telefon - Dutch: - 5 inch Android telefoon - French: - 5 pouces téléphone Android - German: - 5-Zoll-Android-Handy - Hebrew: - טלפון אנדרואיד 5 אינץ ' - Hindi: - 5 इंच एंड्रॉयड फोन - Hungarian: - 5 hüvelykes Android telefon - Italian: - Telefono Android da 5 pollici - Japanese: - 5 インチの Android 携帯電話 - Korean: - 5 인치 안 드 로이드 전화 - Malay: - Telefon Android 5 inci - Norwegian Bokmål: - 5 tommers Android telefon - Romanian: - Telefon Android 5 inch - Russian: - 5-дюймовый телефон Android - Spanish: - Teléfono Android de 5 pulgadas - Thai: - โทรศัพท์มือถือขนาด 5 นิ้ว - Turkish: - 5 inç Android telefon - Vietnamese: - Điện thoại Android 5 inch.